Note: Still playing catch-up on my postings. I have been cooking a lot, but I haven’t had time to write them up. I decided to make this dish with mushroom sauce, which is frequently sold as “vegetarian oyster sauce.” This is a thick sauce made from oyster or shiitake mushrooms. If you are not a strict vegetarian, you may simply use the easier to find traditional oyster sauce. Jan has gone off real oyster sauce, because it is much higher in calories, fat and salt—things that we do not need in our diet. 1. Rinse and trim the bok choy and arrange them in a single layer on a plate that will fit inside your steamer basket. Tip: Unless you are using very large bok choy, it is not necessary to half or quarter the heads lengthwise, but you may do so if you wish. 2. Place the steamer over 2 inches of boiling water and steam for 8-12 minutes, until tender. Tip: How long you steam the vegetables for depends on the size of the heads you are using. Bok choy comes in several sizes, from 3-4 inch heads up to 10-12 inch heads. For this dish 4-6 inch heads are a good size. Note: I use a large wok for this, but a pot with low handles that will not interfere with the seal of the steamer and that is close to the inside diameter of the steamer bottom will work in a pinch. Use plenty of water, because you do not want all of the water to boil away. 3. While the bok choy is steaming, put the oil in a small pot and sauté the onions until soft, about 4-5 minutes. 4. Add the garlic and continue sautéing until fragrant, about one more minute. 5. Just before the bok choy is finished steaming, mix the remaining ingredients and bring them just to a boil. 6. 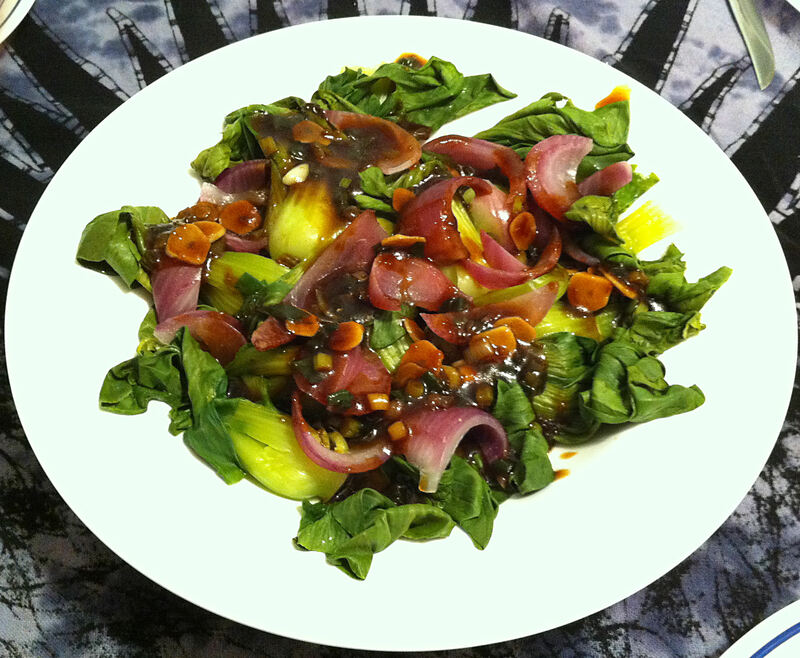 Arrange the bok choy on a serving platter, spoon the sauce over the vegetables and serve.